East Lodge is located on Victoria Road, Forres, IV36 3BN. We're around 500 metres east of Forres town centre on the edge of historic Grant Park. 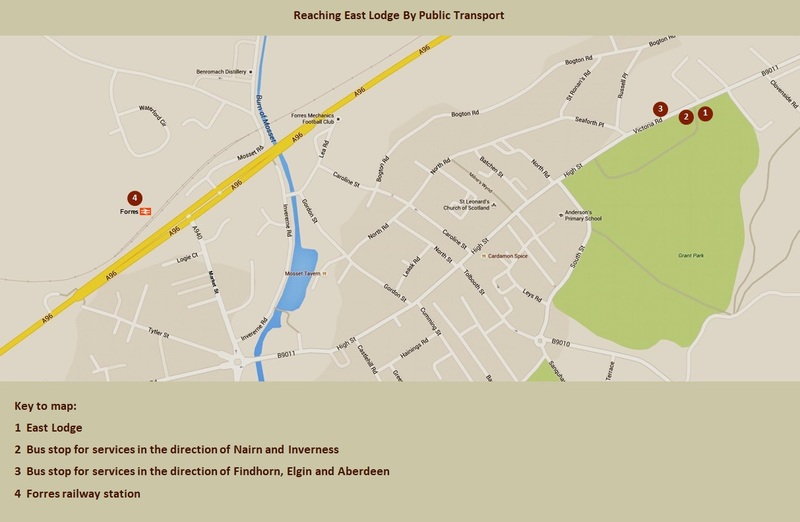 If you’re arriving by public transport, we’re ideally placed for guests using one of the bus services on the Inverness-Aberdeen route, with stops immediately next to East Lodge (see map below). The Lodge is only a 15-minute walk from the town’s railway station should you prefer to arrive on foot, although taxis are available. First cross the A96 and walk along Market Street. At the roundabout go left over the bridge onto the High Street, then simply follow the road through the town centre until you see Grant Park on your right-hand side. East Lodge is at the far end of the park. Motorists should look for the B9011. Parking is at the rear of the property. Guests travelling from further afield who are arriving at Inverness Airport might wish to use the Jet Bus service (numbers 10 and 11) which provides a regular service from the airport to Nairn, Forres and Elgin (and of course into Inverness in the opposite direction). Please see Moray Council’s bus times page for up-to-date information on routes. There are a number of taxi services in Forres, but we recommend Mac's Eco Taxi. To save a copy of the map below click here.